Home / Spirituality / How Did Judaism Differ From Other Religions Of Ancient Times? How Did Judaism Differ From Other Religions Of Ancient Times? 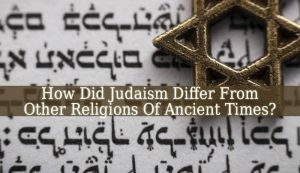 How Did Judaism Differ From Other Religions Of Ancient Times? – Judaism is the second oldest religion in the world that is still practiced. Therefore, it knows a vast history. Judaism is thousands of years old. Having its roots in the 18th century BC. Which makes it about 3800 years old. But how did it appear and how did it become so different from the other religions of its time? The key difference between Judaism and the other religions of the ancient times is the it thought that there was one God for all people. In other words, Judaism was the first monotheistic religion. Although, it has its roots in the polytheistic Ancient Semitic Religions. Judaism combined aspects of the Canaanite and Babylonian religions. And they worshiped Yahweh, the only God. Who appears in the early Hebrew Bible. Judaism’s true origins are traced back to Abraham. Hence, Judaism is an Abrahamic Religion. Abraham, the prophet is the father of all Jews. The prophet founded the patriarch of Israelites, Ishmaelites and Edomites. He becomes a prophet when God tells him to leave his house and settle down in Canaan. Also, the prophet establishes the first covenant between God and humankind. This covenant consists of God blessing Abraham and all of his descendants if they worship Him, the Only One God. You might also want to know What The scattering of Jews outside of the land of Israel is known as or How Did The Balfour Declaration Contribute To Tension Between Jews And Arabs? In Judaism there is only One God. He is the creator of the Universe. And He controls it. Another aspect thought by Judaism about God is that He is not physical. He appears in a spiritual form. Therefore, He was different from the statues and icons adored by the other ancient religions. Also, Judaism introduced the idea that humankind was made in the image of God. Hence, they must be respected and treated with dignity. The Jews live according to the Will and Laws of God. This being their way of serving Him. Another important aspect of God, in Judaism, is that he allowed humankind “free will”. Therefore, people can choose from doing good or evil. But this also creates responsibility. Because every human being becomes responsible for his own actions. Another aspect in which Judaism differentiated itself from the other ancient religions is that it tried to introduce a more spiritual aspect of religion. Because the other ancient religions were all about ceremonial and physical worship, statues and pictures. Also, Judaism forbade human sacrifice, which was widely popular in that time. 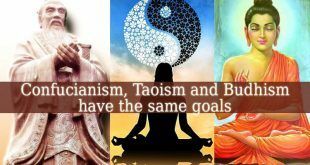 But the biggest difference still remains its monotheistic philosophies. Previous What Region Contains Holy Sites For Islam Judaism And Christianity? Next Early Christianity Is Described As Being A Sect Of Judaism. What Is A Sect?